I believe Nutrition, Movement, Sleep, Breath, and Community are the five components to consider when addressing our health. However, sleep is usually the one pushed aside. It is the last thing on our minds when we have a million things to do in the 24 hours we have each day. Shawn Stevenson learned the value of sleep as he went through his own health transformation. In college, he was diagnosed with a spinal condition called degenerative disc disease. According to Shawn’s doctor, this was an incurable disease. That his spine was rapidly deteriorating and he had a spine of an 80 yr old man. But instead of merely managing through the pain, he became proactive at learning more about his body and overall health. This led him to make changes in his diet and exercise that incredibly made the pain disappear and eventually healed him. Sleep also played a big factor during this healing process. Because of the powerful way sleep transformed his health, he knew he needed to write a book about it. If you’d like to learn more about Shawn’s story, listen to his podcast episode, My Story of Healing: The Soul and Science of Transforming Your Health. 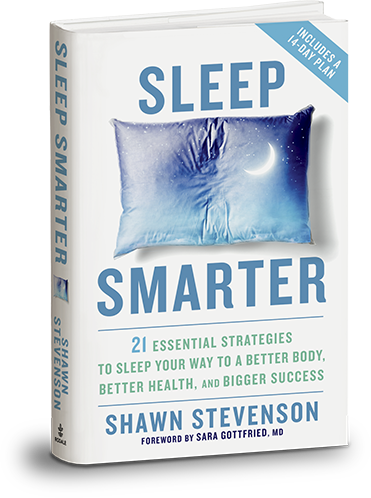 Sleep Smarter covers 21 strategies to help you become a champion sleeper. Here are five tips to get you closer to the sleep you deserve! These are also the five I’m currently working on. 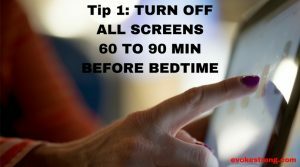 Artificial blue light emitted by electronic screens triggers your body to produce more daytime hormones (such as cortisol) and disorients your body’s natural preparation for sleep. Aaaaarrgghhh!! This is such a hard habit to break! I am controlled by my devices, from laptop to cell phone to the big screen TV. My current goal is to start at 30min before bed which I still find challenging. Then eventually tack on a couple of minutes at a time to get me to the 60min point. If I do better at prioritizing what needs to be done during the day, I won’t leave unfinished matters to do at night. The ‘Social Media black hole’ is another issue. This is when you intend to spend only a couple of minutes on social media, then the next thing you know a half hour passed! When we scroll on Facebook, our body produces a powerful chemical called dopamine. Dopamine is a brain chemical that causes a seeking behavior. And it’s followed up by the opioid system giving us the pleasure of the results of what we sought. It’s a continuous loop where we constantly seek and are rewarded. How do you solve this problem? By finding an alternative equally pleasurable. For me, it’s reading a book and writing in my journal. For you, it could be listening to music or talking with your loved one. And if you really have a need to do work to meet a deadline, Shawn Stevenson recommended a blue light blocker whether it’s a pair of glasses or an application (he uses f.lux) on your computer screen. I think all smartphones and newer laptops has a nighttime setting to block out the blue light. Electronic devices emit both electric and magnetic fields known as EMFs. EMFs have been found to cause disruption in the communication among the cells in our bodies. Even though I invested in a separate alarm clock, I still find myself setting the phone on my nightstand. I sometimes use the Calm app for a sleep meditation session. It has helped with getting thoughts out of my head to lull me to sleep. I think eventually I can re-create the session without needing the guide of the app. In the book, Shawn details the risks of cell phone EMFs. 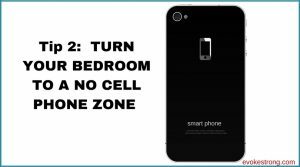 In 2011, a document was released by the World Health Organization (WHO)/International Agency for Research on Cancer (IARC) classifying cell phone radiation as a Group 2B carcinogen based on an increased risk of a malignant type of brain cancer, glioma from cell phone use. Yikes! And EMF also affects our sleep, that it significantly disrupts melatonin secretion. “Melatonin is produced by the pineal gland and other tissues in your body that send signals to your cells to prepare you for sleep.” When melatonin isn’t properly secreted, the quality of sleep is negatively impacted. What’s your thermostat setting at night? The body’s core temperature fluctuates throughout the day. At night, when your body is ready for bed, it automatically drops to prepare for sleep. Apparently, if your house is warmer than the ideal temperature it’s harder for your body to get good sleep. This has happened to me when I purposely went to bed early, but forgot to open the window to cool down the bedroom. I tossed and turned all night! Pulling the covers off me but I’d put them back on because it felt weird to sleep without a blanket over my body. But then I’d get hot again and it was a sleepless cycle of covers on then off. Besides the thermostat in your home, you also have to check your “Internal Thermostat”. 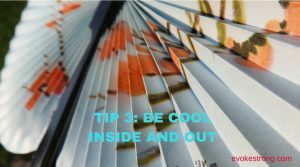 Stress and anxiety are likely contributors to an increase in core body temperature. Meditation increases ‘feel-good’ hormones and endorphins, lowers stress hormones like cortisol, and even reduces inflammation in the body. Speaking of strategies to manage stress, meditation is one of the best ways to do it. As Shawn points out, it shouldn’t be complicated. You can make it as short and simple with a five minute session – focus on your breath as it moves in and out of your body. 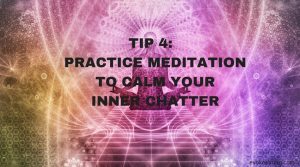 The trick is to do it more often throughout the day to feel calm and stay present especially during stressful moments. I mentioned earlier about the sleep meditation session I sometimes do at night. It’s usually five to ten minutes. I also do a short session in the morning. From the book, I learned morning is one of the best times for meditation. Remember, food isn’t just food – it’s information. And the types of food that you eat, along with the nutrients they contain (or lack thereof), automatically incite processes that determine what your body, health, and sleep will look like. 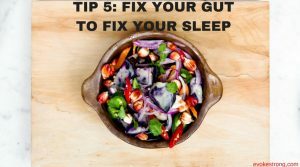 Your gut health is connected to sleep due to serotonin, where 95% of it is found in the gut. Serotonin is the building block for melatonin. As mentioned previously, melatonin is the hormone that signals your body to sleep. In the book, you can learn more about the physiology of the gut with the way serotonin is produced relative to the health of your digestion. Basically, you want the bacteria (friendly and unfriendly flora) to achieve a natural balance to effectively produce serotonin and melatonin. Be very cautious of these items as they have been clinically proven to damage your gut microbiome: Agricultural chemicals ie. pesticides, Processed foods, Repeated antibiotic use, Chemical food additives and preservatives, Chlorinated water. Are any of these strategies already a part of your optimal sleep quality practice? If they are, yet you still struggle with sleep, many more tips are available in Sleep Smarter . I find myself referring to this book when I notice my quality of sleep has been sub par. Check it out for yourself! Note: This is the first book in the series of health and transformation books I intend to post on the blog every month. If you’d like to be notified of future book posts, please subscribe below. Thank you! Previous postHealth News Too Good to be True? Be Critical! I’ve always been so bad about getting good sleep… I need to check this out! I think it’s a great resource. The final pages of the book is dedicated to incorporating the strategies day by day into a 14-day plan to make it even simpler for those who are interested in upgrading their sleep quality. Thanks for all the tips!! I definitely need to practice some of these. You’re welcome Brandi. I hope it was helpful. Wow Jenny, that’s an awesome goal! I need to set the same as well since I’ve been waking up very early (around 5am) but haven’t adjusted the time I go to bed. Yes definitely check out the book. Thank you! I love sleep haha that being said, I USUALLY go to bed too late. I’ve been trying to get to sleep by 10:30, though, and I see it helping! Gosh I remember sleeping in very late in the day on the weekends before I had kids. Not anymore! My problem is going to bed late as well. My goal is around 10pm. Sleep is one thing I have never had a problem with, I can sleep almost anywhere. But this was very informative and I’ll be sharing a few of these with my husband. Thank you! Good to hear sleep is not an issue for you at all. This is all great advice, I definitely need help with sleeping. I agree that turning off electronics is a hard habit to break! Just like now, I’m on my laptop right before bed….. haha. Thanks Stephanie! Yup electronics is my weakness but working on limiting the amount of time I spend on it each night. Wow, what a great in-depth post on a very important area for our everyday health and ability to enjoy life and be productive. I know I will be referring back to this and reading for at least a second or third time to get all the points but it will be worth it to improve my own sleep quality. Thanks Nicole – I hope it helps! I’ve been having a hard time getting to sleep but I also am on my iPad before bed and never thought before about how that effects my sleep…. Yes I believe the light from these devices significantly affects our sleep cycle. Hope your sleep improves soon! This is really interesting. Any strategies to get better sleep are welcome over here, lol. Fabulous advice. I need to take it to heart…as I sit here typing in bed! I understand – it’s more common for us nowadays to do work before bed.